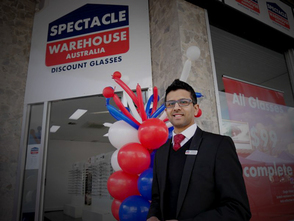 Spectacle Warehouse opened it’s doors at 44 Wells Street Frankston 3199, on the Mornington Peninsula in August 2014. Since then, we have been dedicated to supplying an innovative new service, dispensing spectacles at discounted prices. Optometrist and business owner Dheeran Makadia has brought the business model out from the UK, offering value spectacles to all customers, whether they’re tested in store, or elsewhere. At Spectacle Warehouse everything is made using the best technology available. The use of German designed lenses ensure the highest quality lenses and vision, without the added price tag. With the lowest prices for such high quality products, we have taken the competition out of choosing glasses. We have a wide selection of frames including Merci Merci, Alternance, Archipelago, Gino Vego and in house designs catering to all shaped faces and personalities. The set prices for all frames and lenses allows customers to choose any combination of the two for a set, clear and affordable price, eliminating the confusion often partnered with choosing specs.